Susan Hayes and her crew spent seven days fishing with us during the holidays. Here is the bounty from one of their trips. Here we are smack-dab in the middle of our winter fishing season and, it’s been outstanding for all the species that love cooler water temperatures. We’ve had a steady run of sailfish off the reef edge, and there are good numbers of blackfin tuna mixed in where we’re finding the sails. January gave us some excellent wahoo fishing, which should spill into February with the presence of larger fish in the 30- to 50-pound category that tend to show up in the winter. Most of this action has been on live bait, primarily pilchards and cigar minnows. The wahoo respond to goggle eyes or small bluerunners fished down 50 to 80 feet while you’re live-baiting for sails and tunas on top. Something you don’t see everyday, a margate, which was caught by the Shelton group. 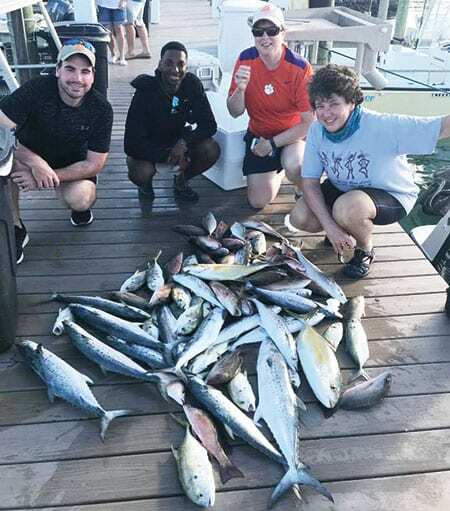 Around the wreck and artificial reefs, there’s been lots of king mackerel action, with fish averaging 10 to 20 pounds and some approaching 40. 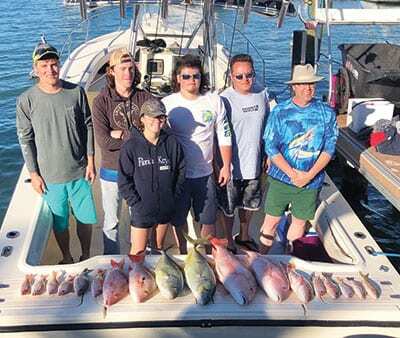 On or near the same wrecks, you’ll find amberjacks, mutton snappers and big yellowjacks on the bottom. Live pilchards, ballyhoo and cigar minnows are the prime baits for wreck fishing. There’s been loads of action on yellowtail snappers on the reef, but you need to keep your eye on the weather this time of year. Don’t bother yellowtailing just after a cold front. Rather, wait a couple of days for the weather to stabilize and the temps to warm up, which will spur on the yellowtail bite. 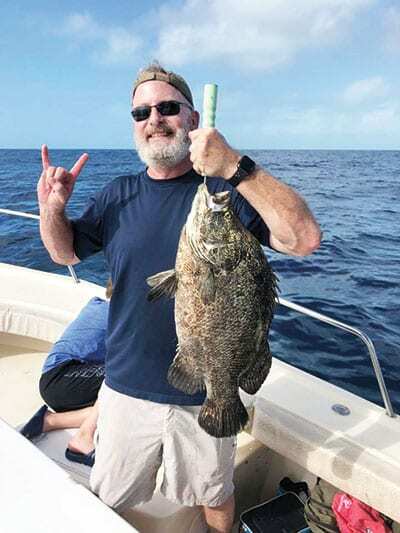 The Lott group caught a pair of tripletail. Additionally, you don’t want to overfeed the yellowtails during this timeframe as their metabolism is not as fast as it is later in the spring with the warmer water temps. So, be a tad stingy with your chum and Aquatic Nutrition products right now. There’s also plenty of mackerel activity on the reef for cero, Spanish and kings. Live pilchards and ballyhoo work well fished back in your yellowtail slick. Alternately, a shrimp on a jighead worked back in your slick will produce fast action. You might also catch some nice-size yellowjacks. The Underland family had several outings with SeaSquared during the holidays and always came back to the dock with a stellar catch like this. While there’s plenty of good-eating fish to be caught on the reef, our most consistent fishery for snappers this time of year is Hawk Channel. You’ll catch all four of the main snapper varieties at play here, including yellowtails, mangroves, muttons and lanes. Shrimp on a jighead fished on the bottom is the way to go here. Lots of groupers and hogfish will also end up on the end of your line. They all must be released immediately as the season for them is currently closed. The good news is we’ve caught some respectable porgies in Hawk Channel recently, and there’s no reason for that not to continue into February. 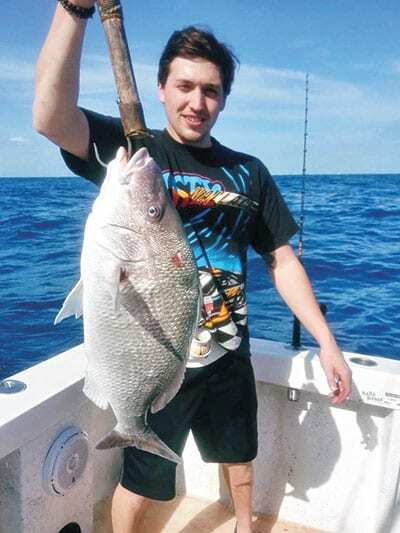 Porgies make a great substitute for hogfish in food value. Hawk Channel holds an assortment of mackerel as well. Use the same baits as yo do on the reef. If you choose to fish in Florida Bay, you’ll fine consistent action for mangroves, seatrout and Spanish mackerel. Shrimp and small pilchards are the baits to use in the bay venues. Capt. Chris Johnson is hosting a monthly fishing seminar series at the Hyatt Place in Marathon. The topic for February is Fishing Artificial Reefs, and the seminar takes place on February 5 from 6:30 to 8:30 in the hotel conference room. Check our Facebook page for the complete schedule. Capt. Chris Johnson specializes in offshore, reef/wreck, gulf/bay, saifish, shark, tarpon and lobster fishing with SeaSquared Charters. For daily fishing reports with pictures, please click over to Facebook.com/MarathonFishing.